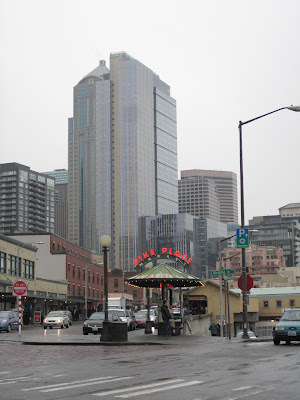 Yesterday after I finished working in Seattle, I ventured out to explore a bit. 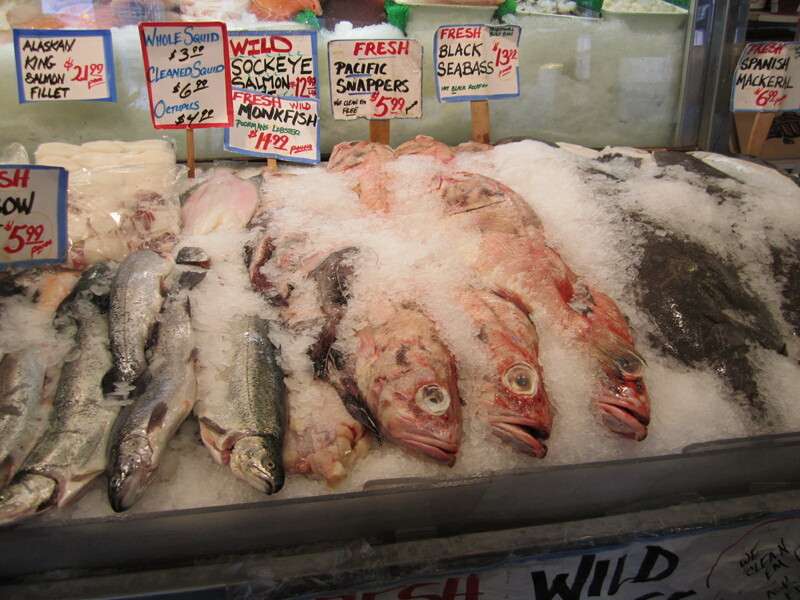 My hotel shuttle driver dropped me off right in the heart of downtown at Pike Place Market. It was a grey and dreary day, but I didn't mind one bit. I mean, it's Seattle for goodness sakes! Of course at the market there was a lot of great fish and seafood available. 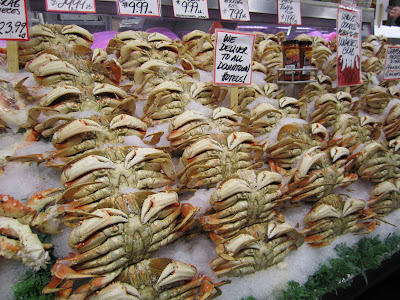 If I lived locally, you better believe I would have picked up some of those beautiful big crabs. 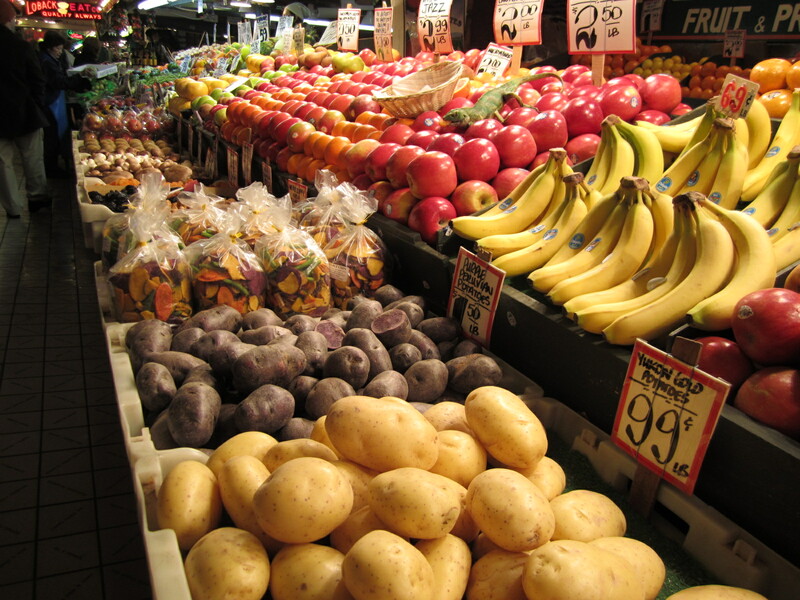 There were lots of stands in the market with colorful produce. Th﻿e purple Peruvian potatoes also would have headed home in my grocery bag. Probably some of those veggie chips too! Fried chicken livers and chicken hearts? No thanks! 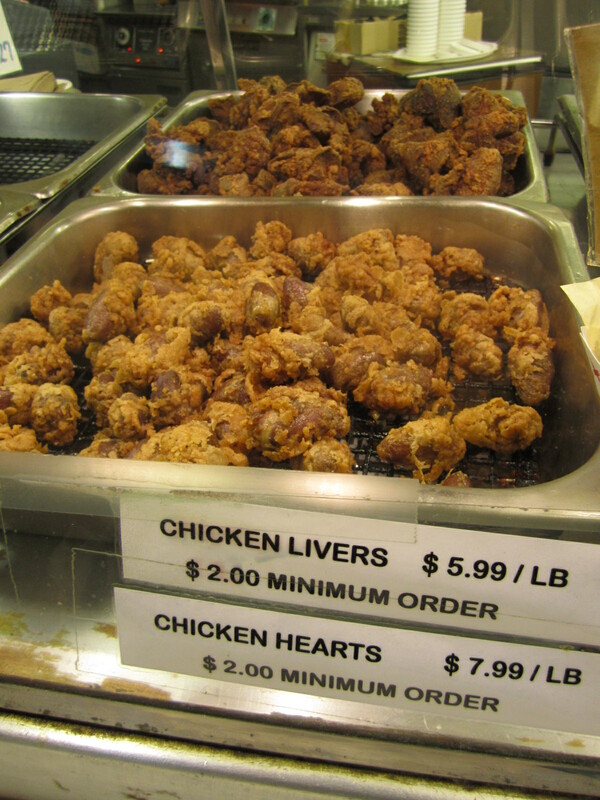 ﻿ I'll pass on those. Kinda made me feel like I was back in the South again! For lunch I headed right across the street to Beecher's, where I got a fantastic sandwich. 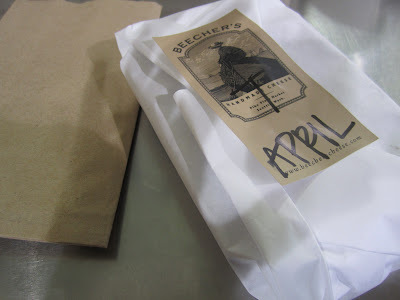 They come wrapped in thick white paper with a Beecher's sticker right on top. 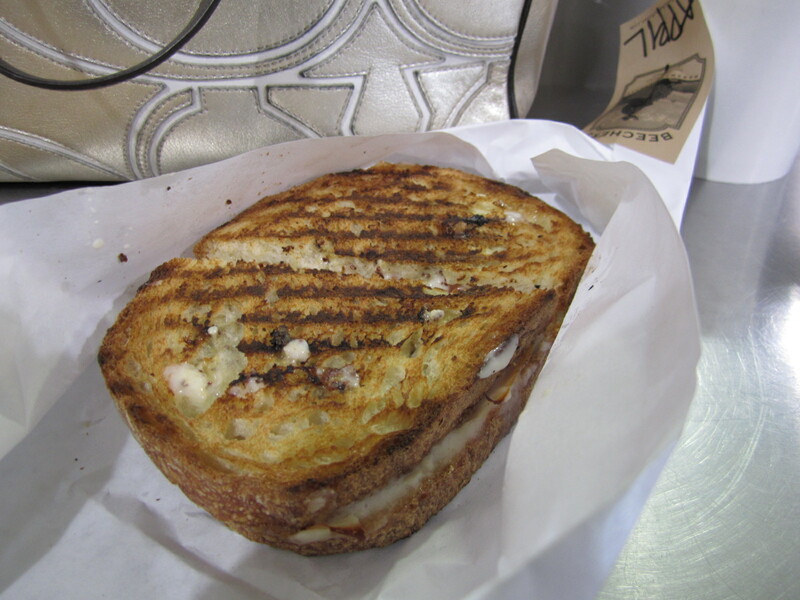 My grilled sandwich had thick slices of smoked turkey﻿ along with tomato slices and lots of good cheese. It was perfectly gooey. 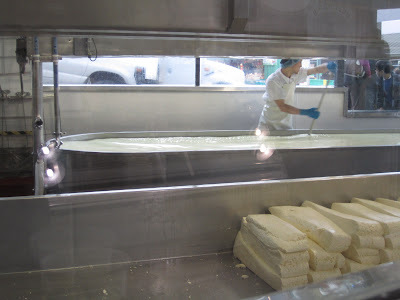 I sat on an old milk jug stool at a countertop and looked right through the glass to watch them making the cheese in front of me. And yes, those are huge blocks o﻿f cheese in the foreground of the picture! 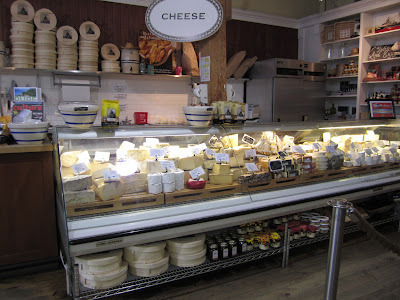 Their cheese selection in the store was just insane. 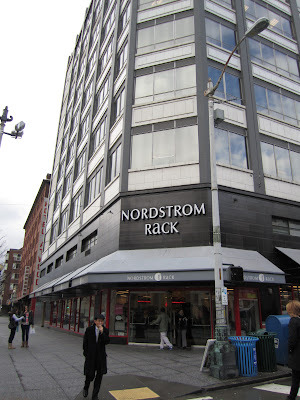 After checking out the market and having lunch, I headed to Nordstrom Rack. I tried on lots of cute dresses and almost ended up taking a pretty and colorful Tory Burch blouse home with me, but at the last minute decided to pass on it. I have a little bit of non-buyer's remorse today, not gonna lie. 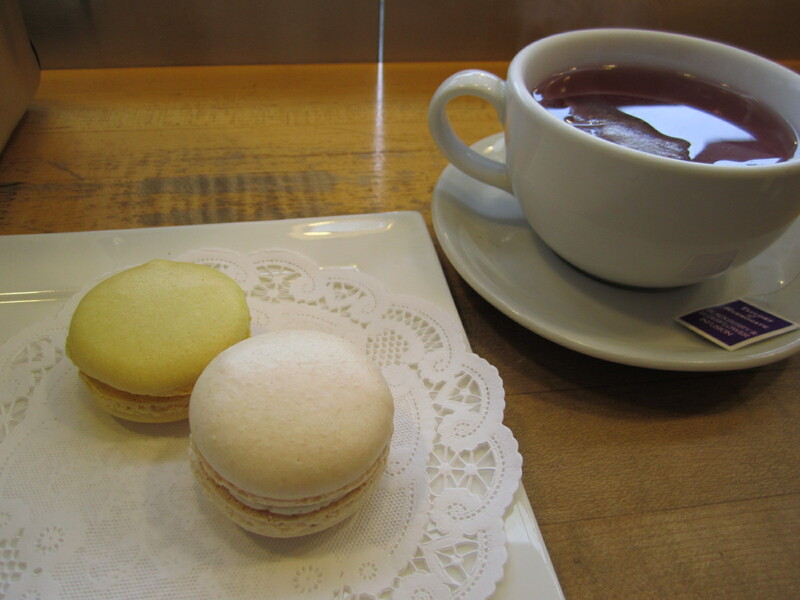 And I ended the afternoon with some hot blackberry tea and lemon and vanilla bean macarons at a great French bakery, Le Panier.﻿ This place is just wonderful. I sat on a wooden stool looking out the front window to the goings-on at the market and just enjoyed the time to people watch. So now my Portland adventure begins, and then Berkeley will get a visit on Thursday. Friday is my day to travel back home. While this has all been a lot of fun and a nice adventure, it will be so nice to have a low-key evening with the boy and the dog back in North Carolina. Seattle is such a cool city...great classic Seattle pics! Love 'em. i really wanna get to Seattle one day - 1 of the cities i never visited - and i WANT a Nordy rack by me!!!!!! new to ur blog - wanna be blog buddies?! Glad you got to check out a new part of the country! It is definitely fun to see different places but sometimes enough is enough....Friday will be here soon! I cannot wait until Nordstrom Rack opens here. One time I was in Philly, I got an amazing Trina Turk dress for under $100. 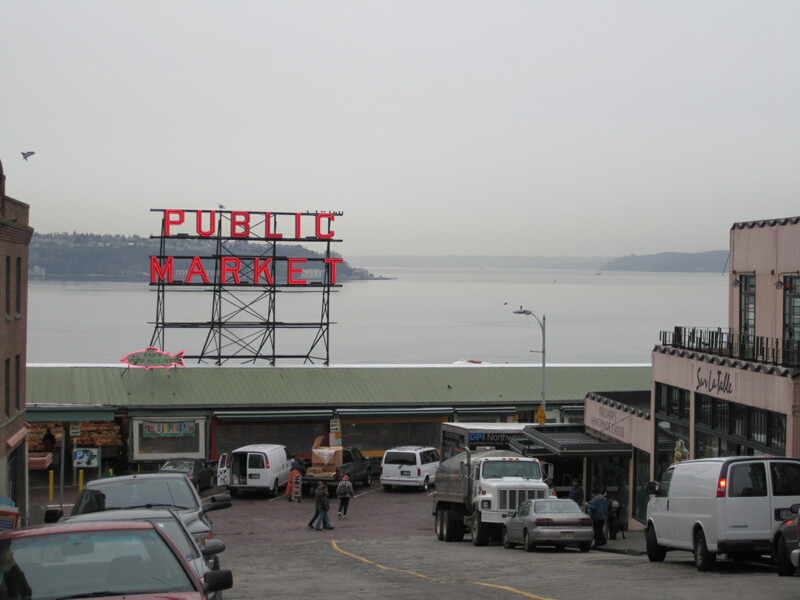 I love Seattle! Hope you have fun in Portland! It was snowing this morning, now it's just raining :( Hopefully you still enjoy it! this makes me want to go to seattle! Enjoy!